The Edinburgh People's Festival have launched a short pamphlet to mark the anniversary of the Russian Revolution. The pamphlet brings together quotes from well known political and cultural figures world wide, some from history but many written especially for the pamphlet. The publication follows on from the recent meeting which saw 250 turn out to hear Trevor Griffiths, director of the film Reds speak at an EPF sponsored event. 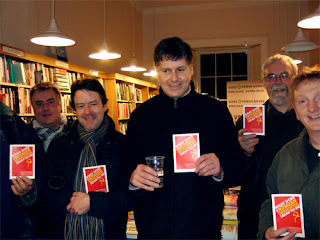 Here is a short clip of EPF chair Colin Fox introducing the event which was held at WordPower bookshop in Edinburgh.